SEPTEMBER FIG FEST | Jane Lear. Writing on Food and Travel. In September, nature has a certain magnificent unconcern. Zinnias still bloom their heads off, rising above foliage wrecked by powdery mildew. Cosmos, bearing blossoms the size of teacups on their tall, feathery stems, straggle and sprawl with abandon. Bumblebees spend hours nuzzling the dahlias, then struggle to lift off under the weight of their yellow pollen pantaloons. And at farm stands, all hell is breaking loose. I can’t be bothered yet with the butternut squashes and pumpkins, broccoli and cauliflower, pretty as they are. Instead, I crave the succulence of late summer and early fall in the form of tomatoes, corn, and figs—fat, ripe figs. 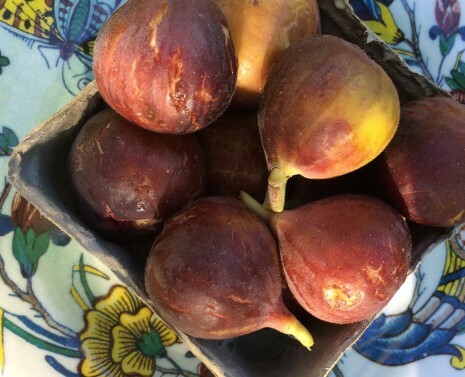 Although many fig trees produce two crops, one in early summer, and another in late summer and early fall, in general, second-crop figs are smaller and sweeter, with a more intense flavor, and whenever I see them, I pounce. I grew up with the ‘Celeste’ cultivar—what my grandparents called sugar figs. As I wrote in an early post, Celestes are the most ephemeral of fruits, with paper-thin skin that makes them too fragile to ship. The ones you see above, from a North Fork farmer, are a different variety, one called ‘Brown Turkey.’ They have thicker skin and a milder sweetness than Celestes, but no complaints: We ate the ripest ones—sun-warmed, cracked to bursting, and slightly sticky with juice—over the sink as soon as we got home. To bring out the best in firmer, less-ripe figs, spread them on a platter or baking sheet and leave them for a day at room temperature. Keep a close eye on them, and discard any that get moldy. Although figs are wonderful in desserts—a cake or almond tart, say—I use them more in savory dishes, and the time-honored Italian pairing of raw, ripe figs and top-drawer prosciutto is just the beginning. Turn that concept into a salad, topping the prosciutto with arugula, nuggets of your favorite blue cheese, chopped toasted walnuts, and a tumble of quartered figs. Instead of putting the blue cheese in the salad, you could mash some into a dressing made with cream and a little white-wine vinegar, or even put the figs in the vinaigrette à la David Tanis, who fantasizes about having a fig tree right outside the kitchen door. Another person who is passionate about figs is Georgeanne Brennan, whose leek gratin got us through a long chilly spring. Among the treasures in her La Vie Rustic online store are cuttings from the historic Sultan de Marabout fig tree in her backyard as well as a sea salt and dried fig combination that adds spark and savor to just about anything. She introduced me to the pleasures of a fig and goat cheese pizza in a cooking class years ago, and she also taught me that the way to keep fig flavor high when cooking fresh figs is to add chopped dried figs into the mix. That trick works to very good effect in the following recipe, which is a delicious way to swing into fall. Georgeanne likes to serve the pork roast with creamed or sautéed spinach and garlic-mashed potatoes. “It’s a simple yet fancy-seeming meal,” she explained. And how. Ask your butcher cut off the rib bones in a single separate piece, then tie them back on. You can do also do the job at home with a sharp knife; just keep close to the bones as you cut. A pan sauce gives this dish even more finesse, but skip that step if you like and drizzle the sliced meat with any juices left on the cutting board. Make the stuffing and prep the roast: Preheat oven to 475°F. Trim the tough stem tips from 3 of the fresh figs and the dried figs. Chop the figs and put them in a small bowl with the brandy, garlic, sage, chile flakes, ½ teaspoon salt, and a pinch of pepper. Let stand for a few minutes, until the figs soften, then mash the mixture with the back of the fork to make a paste. Cut off the strings holding the bones onto the roast and put on a cutting board with the bone side closest to you. Rub the meat and bones well with salt and pepper, then pack it with the stuffing. Put the ribs back in place, making sure they are in the same direction as they were cut, and tie the roast with kitchen string. Make the glaze: Combine the water, wine, and sage in a saucepan over medium-high heat and reduce to ½ cup, about 5 minutes or so. Meanwhile, trim the stem tips from the dried figs and finely chop. Add the figs and honey to the wine mixture, reduce the heat to medium, and simmer until the figs are soft and the liquid thickens and is reduced to about ¼ cup. Remove from the heat and pour through a fine sieve into a small bowl, pressing against the fruit to get all the juice out. Reserve the liquid and discard the solids. Roast the pork and finish the dish: Place the stuffed roast in an ovenproof skillet, bone-side down, and roast 15 minutes. Reduce the heat to 325ºF and continue to roast, basting once or twice with the glaze to burnish, until the meat registers 140 to 145ºF or so on an instant-read thermometer (do not touch bone), about 45 minutes. Transfer the roast to a carving board, cover loosely with foil, and let rest 5 to 10 minutes while you make the pan sauce. Place the skillet over medium-high heat and slowly add the wine, scraping up any clinging brown bits with a wooden spoon. Bring to a boil, reduce the heat to low, and simmer about 5 minutes to blend the flavors. Stir in the butter and keep warm while you carve the roast. To carve the roast, first cut off the strings and discard them. Gently remove the ribs and separate them. Cut the meat into ¼-inch or ½-inch slices, depending on your preference, and arrange on a platter along with the ribs. Stir any juices on the cutting board into the sauce and quickly warm it through. Trim the stem tips from the remaining fresh figs and cut into quarters. Drizzle the sliced pork with the sauce and garnish with the figs.